You may love your brand and think it’s amazing. And maybe your girlfriends, your parents, and your dog agree. But none of that matters unless your market is just the guest list for your Thanksgiving dinner. You hope your customers feel the same as you do about your brand. But that’s rarely the case. Your brand’s online reputation is constantly evolving and re-defined by every social media comment, review, and blog post. When someone discovers your business, they make judgments and buying decisions based on this content online. So if you want to stay ahead and keep your business afloat, you need to proactively manage and improve on all the feedback you receive from the internet. 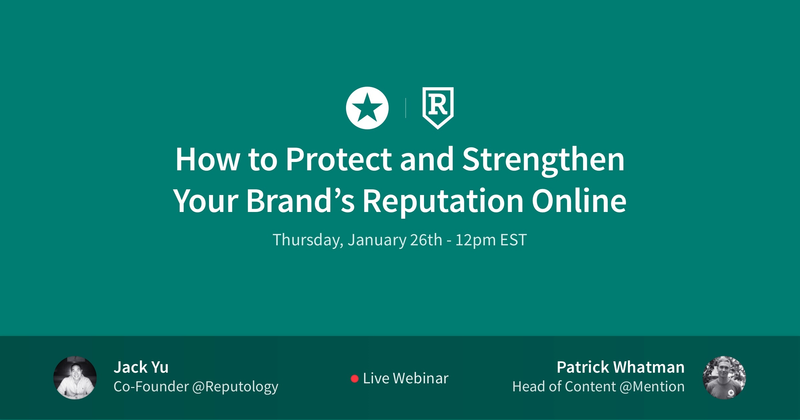 As with everything, there are practical steps you can take to proactively improve your online reputation. In this blog post, we’ll talk about five things you can do to make sure your brand is always presented in the best light possible. Monitoring your brand online helps you find out what your brand image looks like right now. That’s the first step – if you don’t know what’s working and what’s not, it’s tough work trying to improve anything. What you monitor depends on where your brand is present. Do people talk about you on social media, on forums, or on review sites like TripAdvisor or Amazon? Do you even know? If you’re a restaurant, bar, or tourist attraction, you need to at least monitor review sites. If you have a physical location, you can bet that people give their opinions about you on Yelp, TripAdvisor, and Google. If you sell physical products, you also need to keep an eye on Amazon, eBay, and other online retailers. On top of these obvious review sites, you also need to think about blogs. You also have forums, blogs, news sites, and all of social media to worry about. And you need to be tracking all those conversations to have a clear grasp of your online rep. But people talk about your brand all over the internet, all the time. Trying to monitor all these conversations on your own is a losing battle. Luckily, there are tools to help. Obviously, we would recommend you do your brand tracking with Mention, where you can track any conversation of your brand, anywhere online, and generate analysis and reports with a few simple clicks. A good media monitoring tool lets you track the whole lot from a single dashboard, so you don’t have to go looking. But if you’re just starting out, not ready to invest in a tool, and want a quick pulse of your online brand, you can try this free tool, the Brand Grader. Their biggest web influencers: major blogs and news sites talking about them online. Their top sources: see whether most of their mentions come from forums, images, or news sites. Brand sentiment: whether people speak about them positively or negatively. For a free tool that takes a few seconds to use, the results are quite powerful. Online reviews are becoming omnipresent. They are the first thing people see when Googling your business. To improve your online reputation, you need a solid strategy to manage your online reviews. Because most of the time, people don’t bother leaving you reviews, unless they’re super mad and can’t wait to vent online and ask all their friends to do the same. Like my friend, Melissa, who was so annoyed at a shop that after leaving one bad review herself, she asked five other people to do so as well. And you don’t want to just leave your online reputation in the hands of these angry customers. After a customer has made a purchase from either your physical store or your online shop, ask that customer to take a moment to provide you with feedback about the products purchased and service provided. If you’re in B2B, customer success or account managers can encourage customers to leave a review after a catch-up call or after helping the customer with something. At Mention, we have an in-app pop-up that asks our user how happy they are with our tool. If they put a score that’s higher than 8 out of 10, we ask if they’d like to leave us a review on a public review site. Most of the time, if customers are happy with your service or product, they’ll agree to leave you a nice message if you ask nicely and tell them how much it would mean to you. There are many other ways you can actively improve your online reviews, like building your official profiles, responding to reviews, monitoring online review sites, etc. None of it is rocket science, so give it a go! Influencer marketing has been a marketing trend for a while now. In the B2C world, big brands generate significant ROI with beauty and fashion bloggers, and the B2B world loves to hear from experts and industry influencers who’ve made it. First, it expands your reach. I haven’t heard of you, but I’ve heard of them. Second, it gives you credibility. I don’t know you or your brand, but I trust them. Third, it allows for cross-promotion. I like them, maybe I’ll like you, too. Knowing this, when we started our video marketing campaign, we decided to bring B2B marketing influencers in our videos. These videos have generated a lot of views, shares, and engagement in our social media channels, and led to multiple syndications, notably on Convince & Convert and Social Media Today. This brand visibility and recognition wouldn’t have been possible if it wasn’t for the influencer’s participation in the video. The key is to find the right influencers that speak to the same audience you’re targeting and has a good online reputation of their own. And when you do influencer outreach right and build long-term relationships with influencers, you’ll get powerful endorsements from these industry leaders that will boost your online reputation. As with any human relationships, living up to your word and being consistent in all areas of your communication with your customers is essential to building a great online reputation. Did you offer a customer a discount as an apology for bad service? Did you promise to “speak to that employee” about an issue brought up over Twitter? Following through and making the changes you’ve committed to are key to maintaining your reputation online. Your marketing team can spend a billion dollars on a campaign about you being a brand “that cares.” But if your customer support is never available or treat unhappy customers disrespectfully, no influencers or marketing speak can help save your online reputation. But if you take it customer feedback as an opportunity to make real changes in your business, and actually improve your organization, savvy customers will definitely notice, and come back for more. Your online reputation is always going to be relative of your competitors’. Do people like you or them more? Why do your competitors’ customers prefer them over you? What are people saying when they compare your two brands? This is all crucial information that will help you improve your own reputation online. But the best benefit of monitoring competitors is that you can avoid a lot of mistakes. Either you see something they’re doing right and can implement it before you miss out any more, or you can learn from someone else’s mistakes. Then there’s the added benefit of being able to reverse engineer their marketing strategies based on what content they put out. From engagement to SEO and content – it’s all public, you just need the tools to find it easily. And that’s where competitive monitoring comes in handy. Luckily, few things are private on social media. And the web in general, really. If your competitor is marketing online, you can probably find it. And analyze their online reputation management. What’s their online review strategy like? Do they do customer support on social media? What influencers are they working with? There are tons of different things to look at: their websites, social media profiles, paid ad campaigns, email marketing sends, PR coverage…every channel and area is an opportunity for you to learn and improve your online reputation management strategy. Your online reputation is like a relationship. Except it’s a relationship you have with hundreds and thousands of people. It’s definitely trickier to manage than a normal human relationship, but the principles remain the same. Be conscious of what people think of you, reflect on their feedback to improve yourself, observe what the others are doing, stay with good company, and be honest and reliable. It’s may not be easy, but it’s simple.